Original short stories, prose, articles and musings that are not even remotely pants..
ONG, long ago there was a young Prince who was curious about everything. The fish in the streams, the birds in the air, even people from faraway lands. Every time he spoke he asked ‘Why? Where? When? Who? What?’ But whatever he asked his father would not or could not answer. Another time he asked: “O my father, why does the dove return to its nest from afar?” But his father would not answer him and bade him sharpen his sword. The prince bit his tongue and held his peace. The old King was proved right in one thing, for one night not long afterwards he who had been brave and strong all his life, took too much wine and fell upon the stone staircase of the castle tower. A sadly commonplace death for a King who had been both a great warrior and a good father to his people, at least in his own way. Now the Prince was King. At last he could turn his mind to the questions which had troubled him all his young life. He sent messengers throughout the world to collect copies of all the books of learning they could find. The books were brought back and were placed in a library so large and splendid that it outshone the king’s own palace with its beauty. The roofs were of coloured tiles, the towers and minarets were covered in gold leaf and banners of every imaginable hue flew from the parapets. The people called it ‘The Palace of Knowledge’ and strangers came from every corner of the world to consult the books it held. The young King was beside himself with joy as he walked amongst the shelves of books and scrolls, for whatever question came to his mind, there were a dozen answers in the volumes of lore he had gathered together. Sometimes the answers agreed, sometimes they did not. The King loved to discuss the answers with his advisers and with the visiting scholars from other lands. Long into the night they would debate the flight of the bee, the depth of the deepest well, the nature of love and the source of life. All that they saw delighted them and the days passed as quickly as the years. As the King grew older he saw that the questions he had asked and debated ten years ago were asked and debated again by new scholars. The arguments were sometimes the same and sometimes different. The King became angry when he found that what he thought he knew was questioned. He no longer delighted in the questions of others; instead he only delighted in his own questions and the answers that he gave. If he had but remembered it he would have heard his own father’s words from years before. But his father was long forgotten. And so the great library became ever smaller and the time spent debating each question ever shorter until the king was sure he had all the knowledge of the world in just one little book. No sooner had the King accomplished his object than a great misfortune fell upon the kingdom; fire broke out in the largest city. “What shall we do O King?” asked the people. And the King went to his little book and found but one answer, “Pour on water,” he told them, and the flames died down and the fire was extinguished. Then there came a summer when the sun shone with a strength that none could remember and the rains failed and the crops wilted in the fields. “O King," cried the people, "we shall surely starve if the crops fail. What shall we do?” The King consulted his little book and found but one answer, “Pour on water,” he told them, and the crops recovered and the people were saved. Another time a rumour spread through the land that fierce dragons had been sighted in the south that coveted the bountiful harvest, the rich kingdom and the palace of knowledge. It was said that the dragons were coming to take the food, burn the kingdom and steal all the knowledge of the world. “O King," wailed the people, "what shall we do?” The King and his scholars opened the book, which contained all the knowledge of the world and searched for questions about dragons. But they found only two answers. One authority said that dragons were huge, fire-breathing winged monsters that none could defeat and another authority said that dragons did not exist at all. But the all the knowledge of the world had already been destroyed by the King and his scholars. All the dragons found was a single book with just one opinion on every subject. 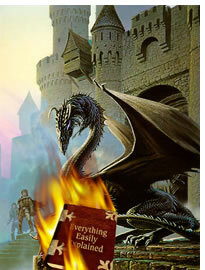 And, on the whole, the dragons disagreed with them—so they burnt the book. Except the page about dragons not existing. They rather liked that bit. © 2006. How Tenji. All rights reserved. The Inquisitive Fish - a story for children and wise adults! Kiddie Fiddling: who are the real paedophiles?